Good morning! I'm in the throws of my after-run endorphins right now, so the idea of spending the day painting ladybugs isn't making me cringe like it might if I'd slept in. It was almost COLD this morning- 54 when I turned on my mac after my run. Yesterday I prepped, waxed, and did single-color glazing for this kiln load. I was happy to get a good day's work done, and there wasn't so much to do that I got bogged down and blue about it (because glazing is my least favorite part of pottery. Isn't that funny, I'm not as thrilled about finishing the work as I am about starting it). 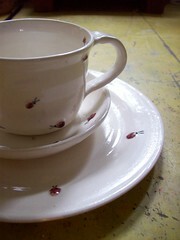 Today I'm finishing the dozen-or-so ladybug pieces, mixing my new dry cobalt blue, and refiring one of my icons. Today the sky is bright blue, the highs are in the 70s, and I've got plenty of work to do. Oh, if you're a knitter, Kirsten Kapur is offering a free Mystery Sock KAL on Ravelry. I'm using some trekking-like ombre blue JL Julia yarn. Even though it's a busy day, I've got the cuff pattern printed and I'm going to cast on when I break for lunch. Hope your day is beautiful, everyone.